We saw in the last part (Universal Coupling) that although the April 1924 edition of the Meccano Magazine stated that part 140 was the latest addition to the Meccano system, there is also a mention on that same page of part 141, the Wire Line (for clock). It is, of course, only used in the Grandfather Clock supermodel, described in the November and December 1923 issues. The description calls for "10 feet of flexible steel wire", but the part was made available in time for the supermodel leaflet which was advertised as being available in the June 1924 issue. Part 141 is approximately 12 feet long. More interestingly, the 18lb weight also required for the clock was drawn up as a part in July 1923, but never issued. It consisted of a 4x4x3" block of lead with a steel hook embedded in the top. The addition of this part would have made an outfit 7 impossible to carry, no doubt! The Wire Line was added to outfit 7 in 1928, and survived through the L outfit, but was never included in the outfit 10. It last appeared in parts lists in 1941, but didn't reappear in the first lists of 1945. Despite a half-hearted attempt to suggest that the wire line could be taken apart and used as a cable for a heavy-duty crane in the July 1930 Meccano Magazine, it remained a part with only one documented use. Variations to this part aren't known at the time of writing. 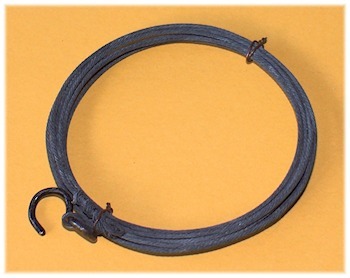 Current examples known to be genuine all appear to be identical, with a twisted loop at one end and a standard wire Hook (part 57) at the other. None known. We need to be careful of reproduction parts here, as the wire line is a very expensive and rare part, very easily reproduced by twisting some off-the-shelf stranded wire around a Meccano hook. I have a feeling a picture of the box will appear on here soon! One of these parts complete with yellow dealers box was sold on EBay a few days ago. thanks for the info. just what I was looking for. many regards Roy. The overall length of this setup is about 123 inches. Could someone provide the outside diameter of this wire, and other details of construction? I found some stranded steel wire which worked very well for my Grandfather Clock, but would like to know how close it is to the correct size.